A MAGNITUDE 7.0 earthquake struck Lombok yesterday – even more powerful than the catastrophic tremor one week ago – killing at least 142 people and sparking a tsunami warning which has since been lifted. The magnitude 7.0 quake struck off the north coast of Indonesia's island of Lombok on Sunday, the Indonesian Meteorological Agency said. It could be felt strongly in neighbouring island Bali, a popular holiday spot for Britons, Australians and Americans. At least 142 people have been killed, Indonesian disaster agency officials have confirmed. The death toll is expected to rise as emergency services make their way through rubble from 13,000 buildings which have been destroyed. 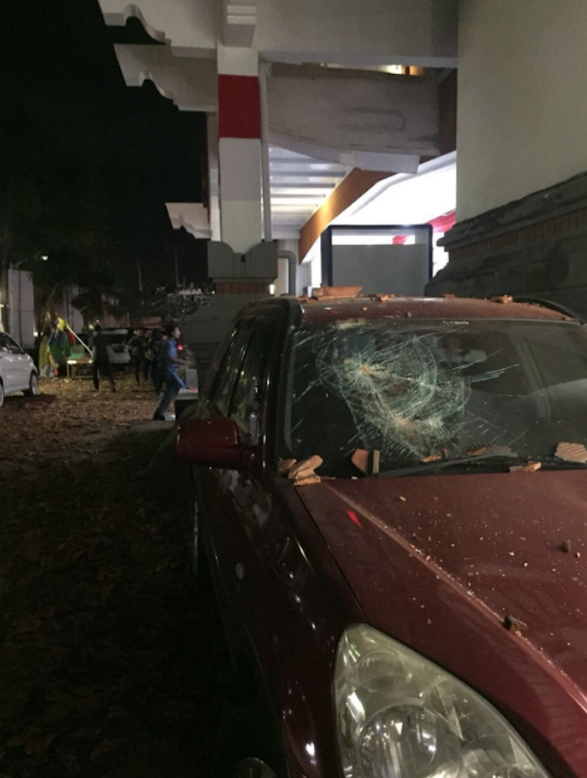 Two people died in Bali from the force of the Lombok quake, according to the National Disaster Mitigation Agency (BNPB). A tsunami warning of a potential tidal wave was issued for the quake, which occurred at a depth of 10 km (6.2 miles) at about 6.46pm local time - but has since been lifted by the Bali Islands Disaster Migration Agency. Model Chrissy Teigen, who is in Bali on holiday, posted on Twitter in the aftermath of the tremor: "Bali. Trembling. So long." She had moments earlier written: "MASSIVE earthquake." Later she said: "Another aftershock just now. Probably the 8th one we have felt since the big one last night. We are safe, up high and nothing around us. Thinking about everyone around us and in Lombok especially." She then asked for attention to be diverted to those in danger. English-speaking residents and holidaymakers described what happened on social media – with many saying it was the biggest earthquake they’d ever felt. One Bali resident posted: "Back in the house now. That was an attention getter. Strongest quake we’ve felt in the 13 years we’ve been here. "Much stronger than the last one in Lombok that we felt in Bali Hope everyone in Lombok is safe." The latest quake follows a similar disaster in Lombok exactly one week ago which left 17 people dead. That quake was also felt in Bali. Residents of a northern village called Mentigi were forced to flee to nearby hills when the quake struck and flattened their houses. the northwest of Lombok, fearing a tsunami would hit. Her husband suffered cuts to his head and legs in the chaos. Speaking as he sat on a trolley at Mataram airport with his leg bandaged, he said: "We are cutting short our holiday because I can't walk and we're just not in the mood anymore, more in the mood to see our loved ones. The Indonesian Red Cross said in a tweet that it helped a woman give birth after the quake at a health post. One of the names she gave the baby boy was 'Gempa', which means earthquake. Blue tarpaulins dotted the hillside on Monday as people prepared to spend the nights outdoors because of aftershocks or because their houses were destroyed. A 50-year-old villager sheltering with his wife and children, who gave his name only as Marhun, said: "We are getting some aid from volunteers but we don't have proper tents yet. "We understand there are other areas that are worse hit but I hope they can get the aid here soon." Some tourists have been trying to leave the area early, with long queues at the airport in the main town of Mataram. Some airlines are adding extra flights. A magntidue 7.0 earthquake is considered to send strong shockwaves through the earth, capabale enough of levelling entire towns and causing widespread damage to the landscape. - Causes damage to most buildings, some to partially or completely collapse or receive severe damage. - Well-designed structures are likely to receive damage. - Felt across great distances with major damage mostly limited to 250 km from epicenter. In the aftermath of the earthquake, Dwikorita Karnawati, head of the Indonesian Meteorology Agency told local television: "Please go to a place with higher ground, while remaining calm and not panicking." Panicked residents posted pictures of a shopping mall crumbling and damaging cars in its staionary carpark. User @Bieberfeverids wrote: "Earthquake from Lombok has also been felt in Bali. Its impacted the building of the mall was failing apart. Im stilll shaking this is so scary." Earthquakes are a common occurence in Indonesia, with the nation situated on the "Ring of Fire" seismically active hotspot encircling the Pacific Ocean.